The upcoming legislative proposal is likely to include dedicated funding for safe routes to school. This is the third and final post in a series about the 2017 legislative session published in partnership with The Street Trust. Read the other installments here and here. The change I’d like to see in the world starts with a great compassion for kids and intersects with transportation choices, aimed at freedom and independence. Ten years ago, I began working at the Street Trust (formerly the Bicycle Transportation Alliance), as a Safe Routes to School coordinator. I joined a dream team of organizers and partners, including: Stephanie Noll (The Street Trust’s Interim Executive Director), Carl Larson (we miss you! ), Scott Lieuallen (local bike hero), Steph Routh (then Executive Director of Oregon Walks, now Communications and Marketing Manager at the Community Cycling Center), Susan Peithman (then with ALTA Planning + Design, now Oregon Department of Transportation Active Transportation Policy Lead), and many others who are still working to make our streets safe for kids. All of us were pretty young back then and learned much of our transportation nerdiness and enthusiasm by being a part of a Safe Routes to School program. What does a successful Safe Routes to School program look like in Oregon? 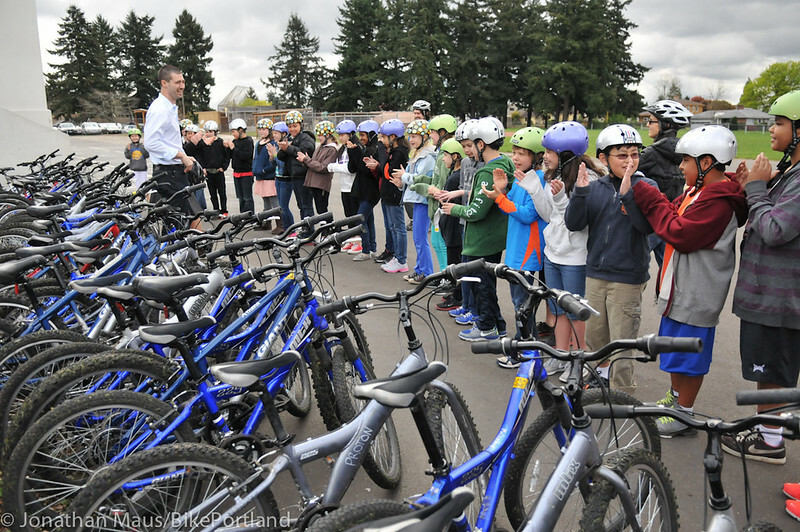 Eager kids get ready for a ride at Roseway Heights Middle School in April 2013. Prioritizing Title 1 Schools (where a majority of low-income students are eligible for free and reduced lunch). Back then, I taught bike — and pedestrian — safety education. Kids learned to ride bikes, to walk safely, and work together as a team. We went on adventures to parks, saw big trees, and explored special places. I led walking school buses. 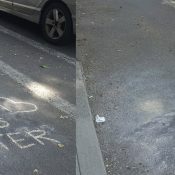 I encountered parents who drove by, stopped, and dropped off their kids, when they wanted to walk with us. I worked with parents, students, teachers, and city engineers to complete walk audits and prioritize safety projects at schools. During those years, I discovered how Safe Routes to School could change the lives of kids and their families. I heard countless stories about kids who went home after bike-safety educations classes, convinced parents to dust off their bikes, pump up the tires, and hit the road; all the while, teaching anyone who would listen hand signals for safe turning. Teachers told stories of kids who joined walking school buses and then did better in school. Parents celebrated when street safety projects were built and made it possible for an entire neighborhood to walk to school daily. 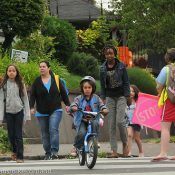 Did you know that when you make streets safe around schools, 25% more kids will walk and bike to school? And, did you know what when you add in education and encouragement programs, 40% more kids will walk and bike to school? Did you know that when you make streets safe around schools, 25% more kids will walk and bike to school? And, did you know what when you add in education and encouragement programs, 40% more kids will walk and bike to school? For cities, counties, and states with goals to reduce congestion and equitably increase the health and safety of citizens – while reducing greenhouse gas emissions – Safe Routes to School is the most effective transportation program. Are you hooked yet? As a Network, we reach about 20% of Oregon schools, with at least a part of a Safe Routes to School program. But, that means that 80% of schools…80% of kids in Oregon…do not have the option to walk, bike or access transit to school. The solution: more funding for education programs and street safety projects, so that every kid in Oregon can have Safe Routes to School. 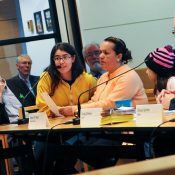 In 2014, Portland metro-area advocates banded together to form the For Every Kid Coalition, to advocate for local funding for Safe Routes to School (read about the exciting results). In 2016, the coalition expanded to include advocates from across the state; to engage in the 2017 legislative session and ensure Safe Routes to School was included in the next transportation-funding package. Create a transparent and accountable process for allocating Safe Routes to School funds, including an annual report. At Metro headquarters after a For Every Kid rally. That’s me, LeeAnne, on the far right with the big smile. 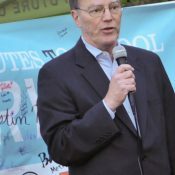 We are unsure how Safe Routes to School will fare during this legislative session; however, the For Every Kid Coalition has risen to the challenge. We gathered over 225 students, parents, grandparents, and neighbors at Safe Routes to School town hall meetings across the state. Citizens became advocates, as they learned how to give effective public testimony and pledged to support funding for Safe Routes to School. Over 2,000 supporters (and counting) signed postcards urging leaders to dedicate funds to Safe Routes to School. However, only YOU can make sure that every kid in Oregon has Safe Routes to School. Sign the petition, and ask your friends to sign a postcard. Join us in Salem on Wednesday, April 12th, to testify in support of House Bill 3230. Call or email your state representative right now! Ride with kids this spring, and learn first-hand the impact Safe Routes to School has across the region. Sign up your school for the Walk+Roll Challenge. Invite your State Representative to join! 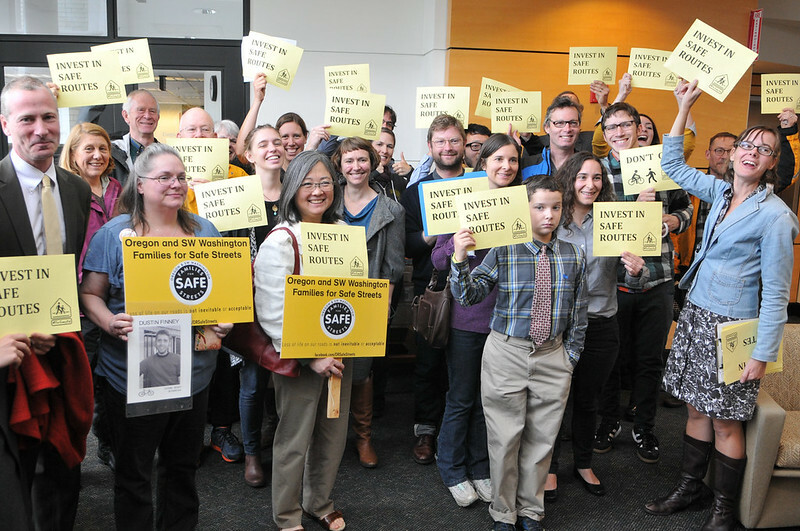 Please join us, and make your voice heard during the 2017 Oregon Legislative Session; this is our chance to win $161 million in funding for safe streets, which includes $16 million for Safe Routes to School. Implicit in that statement is that no child who has not been part of a SRTS program has the option to walk, bike or access transit to school. That’s a bit of an overstatement, to say the least. I believe that SRTS can do good things, but it is far from the be-all end-all in terms of getting young people out of cars. Thanks LeeAnne, and the Street Trust, for all of your work over the years for Safe Routes to School! From the BTA starting the Bike Safety Education Program in Eugene over 15 years ago to us now having three Safe Routes to School coordinators (one in each school district), five fleets of BSE bikes, thousands of kids getting education and encouragement outreach, and millions of dollars in infrastructure improvements we’ve seen a lot of growth and improvement for active transportation in our region. However, when working against the decades of auto-oriented development and societal norms it’s going to take more than what we’re already able to do to make a dent in how accessible our cities are to our children. Safe Routes to School has proven itself to be an effective program to make the kind of changes we need to get more kids and families healthy and active in their transportation options. This bill is a great next step to supporting the program and creating dedicated funding for building better cities for healthier living. 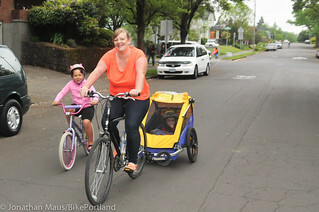 *As a former Safe Routes to School Program Manager in Eugene I am now a ‘work-at-home-dad’ who still works and volunteers as an advocate, League Cycling Instructor Coach, and consultant. They have been a very effective contractor employed by PBOT to implement the program. …and beyond that to inspiring and working with people and organizations throughout the state to help grow their Safe Routes to School program. It’s one of the areas the BTA (now Street Trust) has actually done well with state-wide work. Other efforts at state-wide work was definitely less effective.